One thing has to be awarded to us Italians: the inventiveness, the skill and the artisanal passion that we put into specific sectors, and one of these certainly is food. It is no mystery that the Slow Food movement has a strong following in Italy, and that great care is taken to preserve culinary traditions, quality and attention to “niche” products. So, don’t be surprised if in Italy you can find many chocolate-oriented events. One of them is CioccolaTò (www.cioccola-to.com/english/manifestazione), taking place every year in my home town of Torino: a town with a great tradition for chocolate, which grew even more fascinating after the cleaning, restoration and general reorganization for the 2006 Winter Olympics; a perfect scenery for a big event of national interest (but also international, I would say, considering the high amount of tourists I have seen from all over the world). The 2008 edition took place from February 23rd to March 2nd in the appealing scenery of Piazza Vittorio Veneto, a very huge square right in the middle of Torino’s historical center with a view on the Gran Madre cathedral at the feet of the hills, on the banks of the Po river. As usual, the event had several very interesting guests: from the big “classic” names to a wide array of interesting small artisans. But then, why are we speaking of CioccolaTò? What specific interest may it have for single malt lovers? The answer is simple: among all the chocolate-only stands, one was hosted by a big name of the whisky world, a name which is known for its impressive range of bottlings… from the ordinary and well-known core range, to its exotic and highly sought-after and collectable special releases. The name is, of course, Diageo. As you probably may not know, the Italian headquarters of Diageo are in Torino, at a short walking distance from the CioccolaTò event. What a better idea, then, that pairing some selected chocolates from some of the best producers to some of the finest malts around? 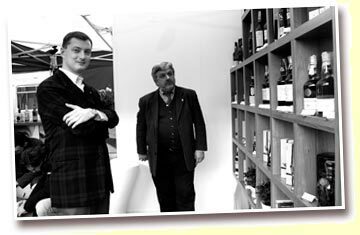 The idea was strongly backed by Mr Franco Gasparri, Master Ambassador of the Classic Malts, and the result was one of the most eye-catching and intriguing stands at CioccolaTò. With the precious help of Alessandro Gravino (Diageo Area Manager “Reserve brands” for center-south Italy) and of whisky expert Ottavia Costanza (plus a very efficient logistics and hosting team), the Diageo stand was a very interesting place to visit, have a chat, take a look at the bottles (including some gems like the 30yo special releases of Lagavulin and Talisker) and buy them, have a dram and discover the world of single malt whiskies. A great idea, since single malts are not largely known to wide audiences in Italy yet: I think that many people walked out of the stand either with a bottle to try at home, or at least a much clearer idea of how whisky is made in Scotland, of the different regional styles, of what makes this drink so special. I had the pleasure of spending some time with Diageo people, and their style of making single malts known and appreciated by the visitors was very efficient: gentle, knowledgeable, refreshingly informal. Direct contact with the audience, great availability to satisfy every question, and of course an attractive portfolio of distilleries. But the core of why this first experience at CioccolaTò was so satisfying was the organization of 52 guided tastings meant to be a “starting point” in the world of single malts. Most of these tastings were offered for free to the audience, and were soon completely booked out: a testament to the success of this initiative. The choice of chocolates for the pairing with the Classic Malts had to be carefully thought out, and what better expert than single-malt and chocolate expert Damiano Verona of “Art and chocolate” for picking up intriguing and exclusive ones? The tastings were organized according to three kinds of sessions: the “harmonic” malts, the “solo” ones, and a special “deluxe” tasting called Pantagruel dedicated to Distillers Editions and the very well appreciated Talisker 18. The sweetest, most delicate whisky in the Classic Malts range: very much appreciated by the ladies (although there are some who actually prefer the strongly peated malts from Islay! ), quite accessible but also enjoyable. Lots of honey, vanilla, sweet licorice, and hints of candied orange and pear. 80 points for its honest and clean profile: much better than a blend, never an unpleasant or unconvincing note, a good starting point for a gentle introduction to single malts. It was paired with a buttery chocolate from the rare Criollo beans, full of bakery notes, low on acidity and astringency, with a moderate and pleasant cocoa bitterness (in spite of the high percentage of cocoa mass). It made the fruity notes of Cardhu more evident, partly masking its trademark honey sweetness. Say what you want, but I always liked Glenkinchie: it is delicate and not challenging, but it is also flawless. A soft, refreshing malt that is a most welcome change of pace from my usual diet of strongly peated or sherried whiskies. It has many subtleties, and very nice flavors of cereals (it is one of the whiskies which remind me most of the smell of barley), hay, vanilla, chamomile, and a hint of lemon peel. Always soft, but not lacking richness. This new 12yo version is very similar to the 10yo, probably a little bit sweeter. For me, it is worth 83 points. Don’t forget that Diageo recently released a very bold Glenkinchie 20yo matured for half its age in brandy casks, which makes an interesting variation compared to the Classic Malts version: a nice one to try head to head. It was matched with a chocolate with a high acidity and tannic astringency, bringing out the flowers and the grassiness of Glenkinchie even more (not to mention some pear taste). The pairing with the whisky, on the other hand, enhanced the coffee aftertaste of the chocolate. A good malt that strikes a nice balance: sure, it is fuller, more maritime and intense than for example most Speyside whiskies, but it still is soft enough not to scare newbies away. It dances between a nice sweetness, some firm oaky tannins, some interesting fruitiness (figs, oranges), and some very evident salty/coastal notes. As such, it suffers a bit from comparison with the big experience offered by Talisker… but it’s always enjoyable, straightforward and flavorful. A friend of mine considers this one of his favorites, and for me it’s 79 points. The pairing chocolate was very rich, nutty and tannic, slightly acidic and fruity. It was the only chocolate from a producer outside of Italy: it is made in Colombia from the same consortium of small farmers who grow the cocoa plants. Very interesting, as it includes roughly ground cocoa beans that give it a raw feelings and a coffee aftertaste. In combination with the Oban, it made its salty, spicy and orangey notes even more evident. A great malt, as usual: full of the rich aromas we have been appreciating for years, a great bottling full of smoke, iodine, medicinal notes but also impressively smooth, creamy and chewy. You really can’t go wrong with Lagavulin, it’s one of the classic that it’s always a pleasure to come back to. I always have a bottle at home, and every lover of Islay malts should too. What makes it so different and unique are its sweet winey notes, full of figs, plum-cake and dried raisins: a perfect match for the hot and peaty character. 87 points. How to find a suitable chocolate for this big monster? Something just as intense was needed: a dark and fruity one, rich of vanilla flavors and with a high acidity. The warm peaty notes of the Lagavulin were almost intensified by the pairing. Good choice! I used to find Dalwhinnie bland, but in time I have found out that while delicate in its aroma, its body isn’t weak at all. Very pleasant, sweet and honeyed but also crisp and lively, with nice pear, banana and vanilla notes. Also some Latakia pipe tobacco in the background, for just a hint of smokiness. In my book, it is worth 82 points. Sure, the 20yo release from 2006 (matured in sherry casks) is a very different beast and a much more stunning malt, but the basic bottling has nothing to complain about. An apparently weird choice: such a delicately flavored malt with such an intense, full-bodied chocolate! Sambirano has very deep and dark cocoa notes, high acidity and impressive tannins (exactly how I like it, and Domori is one of my favorite brands)… but when it joins Dalwhinnie, the vanilla and pear notes of the malt are heightened. A malt that’s both very accessible (gentle, absolutely never aggressive) but also “difficult” because of its complexity, of its very delicate flavors that don’t scream for attention and require careful nosing. Very malty, with lots of flowery notes (rose, geranium, orange blossom), some nice grassiness, and alternating between sweet fruitiness (again, orange peel, apricots), Virginia tobacco and a moderate final dryness, slightly astringent too. Very fragrant, as a consequence, but also very subtle and subdued. I prefer more intense experiences, but it still is an elegant malt: 79 points . A very creamy and buttery chocolate was chosen, rich on dried figs and nuts: quite intense. Not the best pairing with an elegant and subtle malt, perhaps, but not bad either: it made the dry and flowery notes of Cragganmore more evident. Another favorite malt, and probably the one many of us started with… By the way, I am glad to report that the bottles opened at CioccolaTò showed a Talisker back to its true form: more intense and lively than ones I have sampled in recent times, more peppery and peatier. A good sign indeed, perhaps a return to the old style? You already know it all: intense, fiery, hot, medicinal but also very balanced and backed by great sweet vanilla, nice firm tannins and that lovely full and chewy character. In spite of this bold character (or perhaps because of it) many people who tasted it for the first time at the event absolutely loved it. Some more fans for the Talisker… and 85 points from me. The chosen chocolate was the same which had been picked for the Lagavulin 16yo: nice choice, and as a result the Talisker grew even more intense, smokier and medicinal (though a bit less creamy than when tasted alone). Another recent entry in the Classic Malts line, and already a winner. As much as Lagavulin is peaty and hot but also buttery, chewy and sweet , this relatively young Caol Ila is dry, pungent, fresh, vegetal and very seaweedy. Its big blast of peat and medicine truly conquered the hearts of the bravest (including some elderly ladies!!!). The “Natural Cask Strength” version is even better, but this one is a solid 83 points. Its matching chocolate was very full, with lots of figs and dried raisins but also some marked and pleasant acidity (as it often happens with the darker Domori offerings). It brought out the salty and maritime notes of the Caol Ila very well, perhaps slightly taming the smokiness. The most luxurious tastings, held only once every day in the evening… richer in choice of whiskies and chocolates, targeted to a more experienced or simply more curious audience. They were led with the assistance of the nice people from ChocoClub (www.chococlub.com). An interesting whisky, often wrongly overlooked: the delicate notes of the ordinary Glenkinchie are enriched by the finishing, adding a pleasantly sweet but not cloying fruitiness: peaches, apricots, oranges. It’s not evidently winey, and its nuttiness is very pleasant. My score is identical to that of the ordinary 12yo: 83 points . They are different, but both enjoyable. It was paired with a chocolate cream, much thicker than for example Nutella and with a rather high cocoa content for a product of this kind. It’s extremely biscuity, very nutty and sweet both on nose and palate. It has a very mouthcoating feel, and at the end of the tasting it becomes slightly rougher in texture, showing the grain of the cocoa powder. The pairing with the Glenkinchie DE is a bit like Sacher Torte: big sweet chocolate, great biscuity and bakery aromas, and that pleasant fruity background. It probably makes the whisky slightly less sweet in comparison, but the match is very intriguing. While I am not a big fan of Port-finished malts, the Cragganmore DE is quite a nice one: not as weirdly winey or flamboyantly sweet as other experiments of this kind, it still has appeal to traditionalist single malt lovers. Of course, it is VERY different from the ordinary 12yo which is so fragrant, moderately dry, flowery, elegantly restrained… Here, on the other hand, you will find that big fruity sweetness is the main characteristic: ripe cherries, red fruits, acacia honey. Luckily, the sweetness is not overpowering and there still is some spiciness and some nice oaky tannins. Overall I would say that it is a 79 points in my book, again exactly like the ordinary 12yo. Please bear in mind that I am not a fan of Ruby Port (and of Port finishes in general) and that for example many ladies enjoyed this expression very much. The chosen chocolate was very buttery and shiny, with an almost oily visual and tactile impression. On the palate, it had the same very buttery, creamy and thick impression. Its flavor was dark, rich in coffee and vanilla aromas. Very intense, a suitable match for the intense malt: they fought for dominance, but quietly settled together: the Cragganmore DE became a little less sweet in comparison, spicier and nuttier. Crazy me: I didn’t like Clynelish very much at first, then I happened to taste several expressions and to read Serge’s tasting notes on the malts from this distillery (and from its silent sister Brora) and the magic came. Now I enjoy it very much, especially its sweet honeyed notes, its ginger, its spiciness (like the sweet fruit seasoned in sugar and mustard syrup from Cremona), its delicate smokiness and coastal/seaweedy notes. I had never tried this Distillers Edition before, and I was pleasantly rewarded: it has all the good traits of Clynelish, and the extra Oloroso maturation adds some more sweetness, some nice orange marmalade and hints of cinnamon. Very smooth while at the same time intense and syrupy. For my taste, 83 points . 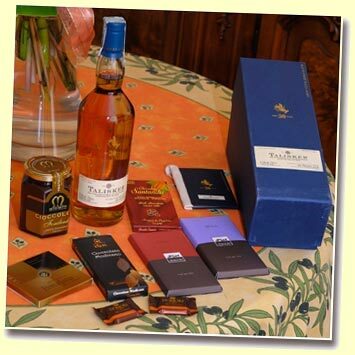 To give an extra boost to the sweet spices of the malt, a very traditional chocolate from Sicily was chosen. Modica chocolate, made by a consortium of producers, is a strange thing: it isn’t smooth or creamy in its tactile structure, and it contains very little amounts of cocoa butter compared to the other chocolates. It is made instead by pressing together cocoa and sugar crystals: the result is very crunchy, very raw, very textured. This particular one was also flavored with a touch of cinnamon: other examples of traditional flavoring include vanilla and red pepper. A nice interaction with the Clynelish, though certainly not a subtle one! And now we come to one of the most appreciated malts of the tastings… In spite of having been introduced only a few years ago, the 18yo version of Talisker is already a big success. Do I need to say more? All you love in the 10yo… but more! It may seem smoother and more restrained at first, then all the trademark flavors of Talisker esplode: the smoke, the gentle medicinal aroma, the vanilla sweetness, the pepperiness, the propolis, the chocolate, the coffee and the rich and rewarding warmth. In addition, we find some more tannins from the oak and an even bigger chewy mouthfeel. No less than 87 points . Talisker is, in my opinion, one of the malts that go better with dark chocolate: a lovely combination. At the tastings, it was paired with one of the best chocolates, too: a thin tablet, shiny on one side and corrugated on the other one. Like the Santander mentioned above, its secret lies in the addition of some roughly ground cocoa beans, for a snappy, crunchy and very chewy feeling. The contrast between the smoothness of the chocolate and the crunchiness of the small bits of cocoa beans was very stimulating. Its moderately astringent taste was rich of coffee notes, nutty, very biscuity. The impression of this chocolate with Talisker reminded me of a good “Cuneese al rum” (rum-filled chocolates). A wild and very flavorful whisky (and don’t forget that it won our Non-Plus-Ultra Award in the Daily Dram category in 2007! ), matched with a very wild and flavorful chocolate… You probably already know the effect of the Pedro Ximenez finishing on Lagavulin: the same bold smoky and medicinal notes of the 16yo, the same raisiny richness, the same iodine… but with an extra sweetness, a lovely smoothness and a winey nose rich on red fruits and plums. I still prefer the more straightforward approach of the traditional 16yo, but this sure is a very enjoyable whisky: the faces of the audience at the tastings showed great delight when this expression was sampled, and rightly so. Such a crafty combination of huge in-your-face peat and fruity sweetness is hard to find elsewhere… 86 points. The peculiarity of this rare chocolate is that it is made not from pods gathered from cocoa trees in plantations, but growing freely in the wilderness. This of course means a lot of effort to find the amount of beans necessary for production of this chocolate, which as a consequence is restricted to limited quantities. It has a fruity nose, but not particularly intense. Very subdued, very dark, very “cocoa”-like. In the mouth it initially has some pleasant acidity, then turns buttery, creamy, very thick and, again, dark. Interaction with the Lagavulin DE brings out a particularly pleasant impression of crème brulèe. Are you still there? Did you resist until the end without feeling the urge to try some of your favorite single malts with some fine chocolate (maybe some Italian one)? Then, let me say you are not human… If, on the other hand, your mouth has started watering… then you are perfectly normal! Overall I must say that the event was a success: a good way to promote the Classic Malts line and the knowledge of single malts in general (every tasting was meant to show different regional styles and to explain how whisky is made, how its flavors are born). There was a lot of enthusiasm from the audience, who flocked to the tastings: I have seen people from 20 to 80 years old, some of them complete beginners in the world of single malts, and they all seemed to enjoy the experience. 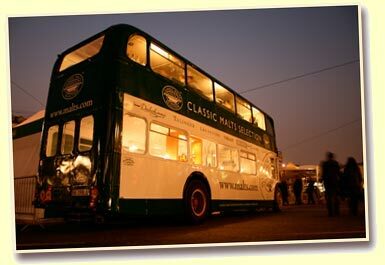 Of course only a big company like Diageo could pull it off: such an event is not easy or very economical to organize. So, kudos to Diageo for deciding to try something relatively new (at least in Italy) to promote single malts! It is a pleasure to see that multinationals do care for trying to share the enthusiasm in their products. For me, apart from the interesting pairing with the chocolate, the event was a further confirmation of the solid quality of the Classic Malts line. Of course I already knew it quite well, but every time I taste this range I appreciate its consistency, its versatility and its high average level: single malts that are easy to enjoy, representative and without any excess or unpleasant note (and with some real gems among them, like Talisker and Lagavulin). Very well crafted whiskies as usual, great to start in this complex world but still interesting enough to satisfy even the jaded connoisseur. And, by the way, thanks to Diageo for enduring my presence at their stand and for granting me the privilege to host five of their tastings: it was a memorable experience! See you in Torino next year, too?